SPOILER FREE! This review is going to be split into two parts: subjective and objective (or the difference between my heart and my mind). We'll start with OBJECTIVE. The art is aesthetically pleasing and the character designs are unique enough that you don't mix up anyone. It pulls off both serious and cutesy expressions very well, but that's standard for shoujo. It also showed me a male outfit that made me go "WTF" in the same way I look at the suits in Kill la Kill. The animation is mediocre at best. The fights are nice towards the end but the beginning is pretty lazily done (a sound effect and a flash). I said before the interspersed serious and cutesy art is nice, but they really don't transition well animation wise. There are some parts which are jarring and completely take you out of the story. Character wise, the three brothers and shirasu (and their relationship) were well developed, considering this is a 12 episode series. Some people might find the third brother, Chuutaro, to be a bit annoying but it doesn't detract too much overall. Everyone else is pretty one note in terms of personality. It's really just from the size of the cast and the amount of backstory that had to be crammed into this. Despite the fact that they all love to blab about their pasts, it ends up feeling like you missed out on a lot of characters. When it comes to story, Donten suffers most from its clumsy exposition. The first episode starts off introducing the characters, the setting, and all that jazz in a pretty standard way. But then it drags on and on into the next episodes because it needs to introduce so many other characters and establish their connection to the main plot, most which is dropped on you like a brick in the form of an episode long flashback. The romance is also mediocre, considering it's between a tsundere chick and a hopelessly devoted dude, though fans of reincarnated lovers probably will like it. Set up aside, however, the execution of the second half of the series is excellent. The action is gripping, the plot twists leave you stunned, and the pay off is emotionally satisfying (or crippling, depending on your tastes). There are a couple, not so much plot points, but character motivations, that are unresolved at the end. With that said, SUBJECTIVELY, I adore this anime. I love all of the character designs so much. The girls are pretty and the boys are hot, and that's enough for me. None of the characters were unnecessary or unlikeable and the story put them all to good use. I loved all the plot twists even the one I saw coming because it's timed so well. Every episode left me itching to watch another one and I'm not ashamed to admit that I cried. I also love the romance as cliched as it is, and I ship two other couples. I would totally watch this again, painful exposition and all! tl:dr Don't judge this one until you get to the end. Basically it's your typical good vs evil anime with the good guys primarily focusing on the 3 brothers, while the 1st two older brothers are far more interesting, the third and youngest...well honestly could've done without him. Didn't really do much or affect much of the story except for maybe like 5 or 10 minutes of the story in ALL of the series. Really. Like your typical good vs evil anime, there are happy times, then tough times and then reunion and then happy time again, gee..didn't see that coming. Honestly it didn't really blow me away or anything. It was a pretty typical setting I've seen a billion times in all the anime I've watched...and trust me I've watched quite a lot. At best it was mediocre. Nothing special. Honestly, it was pretty average. It's clear they didn't get much to work with or else it might have been better. Seemed very early 2000's low budget standards to me. Lots of stills, little action in the fighting, repeated scenes, etc. The usual in a low budget anime. Nothing really caught my attention. None of the music did or had me humming (that's when you know you got someone hooked) one of the tunes, nothing. Pretty repetitive as well. The younger brother, Chutaro was annoying as hell. I guess they did an ok job in choosing his VA if that was the intent. The other VA's I have heard of and they did well. Honestly, I wanted to enjoy it, but there is just so much lacking that I found myself just kind of yawning at times. It was exciting at times, but at times it was boring. It felt like your typical filler anime and probably was. A pretty mediocre anime with ok characters, easily forgettable in my opinion. I give it a low 6/10. Donten ni Warau (Laughing Under the Clouds) is a rare breed. I say this for its ability to tell a story guided by events of the past with a greater focus for the future. Taking place in the present time with a trio of brothers, they have the duty of ferrying convicted criminals as result of high levels of crime rate. That’s the least of their concern though as we find out a malevolent legend known as the ‘Orochi’ that lurks from the past. Should we even call it a legend? It’s known that every 300 years, the Orochi will reincarnate to bring forth destruction. Brace yourself for a story of the fantasy coming ages. The series is based off of the manga the same name written by Karakara-Kemuri with two other prequels taking place some separate centuries before its current timeline. Regardless, the show initially establishes its premise and the first introductory episodes makes it well known for our main characters to focus on the Kamoh family. The three brothers are Tenka, Soramaru, and Chutaro. Although their personalities contrast with one another, it’s easy to see how close they are. It’s fairly important to notice how their relationships are crafted as later events have great influences on their roles. Background story reveals much about the series’ past and also the present conditions of the timeline. It’s a series where you will feel the spirit of the story infusing elements of its themes and characters. From the beginning, the show easily tells itself with the characters’ duties of ferrying convicted felons to a prison known as the Gokumonjo, a stronghold located around Lake Biwa. We are shown exactly what goes on inside the prison as well as how the brothers delivers their duties. The show transits between scenarios to show their daily lives and duties as the primary introduction. What I find the initial introduction of the series to be attractive is its honesty especially in regards with the relationship with the brothers. Some of the scenes may be a bit silly at times but never loses its grip to focus on how close the brothers really are. As such, it’s a sincere story as will be reflected by later events that changes everyone’s lives forever. And if “Orichi” is part of that vocabulary, then it makes the experience that much more galvanizing. The most important element of the show is easily the characters. A great deal of time is used to give them depth whether it’s the mature Tenka, a youthful Soramaru, or the childish Chutaro. All three of them possesses different personalities that gives the audience a stark insight on their characters. To say the least though, it’s easy to tell that the show focuses on Soramaru the most with his roles. As the second eldest of the family, Soramaru is apparently entrusted with a pair of family swords that he practices with each day. And through that practice, we can see him as a potentially great warrior in development. There’s a bit of inferiority complex shown throughout the series as we see him desperately trying to catch up to his older brother Tenka in skill. Meanwhile, we also have the young Chutaro who worships his older brother Tenka like an idol. Foremost, Tenka is a mysterious character who holds his duties as sacred and to always be a guardian for his younger brothers. However, the show shifts to a different scenario where he himself becomes endangered by a mysterious power. The way the show handles itself is quite riveting when you see how quickly the mood can change. Other characters also play prominent roles as part of the story whether it’s the Fuuma family such as Shirasu and his brother. If we look at it carefully, family plays key roles in this show to create a sense of respect and nobility. However, just be aware of plot twists such as those involving Shirasu’s roles later on in the series. And while not romantic love isn’t explicit, the show isn’t shy to turn heads away from it either. From a personal narrative format, Hirai and Botan has a connection that is told creatively through flashbacks and even an episode dedicated for the duo. It doesn’t take a genius to figure out that the show is built on connections either based on reputation, family bonds, or love. It’s where the series truly shines with its powerful emotions. As a supernatural fantasy, expect the unexpected with elements that breaks the law of nature. The most prominent example is the Orichi, a powerful deity that has potential to destroy the world. Others include the important role of Botan, a familiar with gifted abilities. Other spirits and beings that exists in the series are common folklore creatures such as shikigami. While not showing much originality, the series showcases almost every one of their potentials. Action scenes are well coordinated with a solid foundation of the fantasy genre. I also find some of the mystery mixed with the fantasy elements to be suspenseful when plot twists play a role for its larger story plot. A show that decorates itself with creative characters and detailed story is a rare breed and this anime is no stranger to that. Artwork on most parts is delicate and decorated enough to create bring this fantasy story to life. I give the praise for some of the more sincere scenarios that are especially concentrated with high degree of visual focus. This applies to serene flashback scenes as well as moments of emotional drama. Another noticeable factor are the character designs that may be pleasing to the ladies. Most of the male characters have some bishonen traits. To be fitting for the more dark side of the show, the Orichi is designed to truly look malevolent with monstrous attributes. Last but not least is the setting with high volumes of natural features such as the landscapes and more noticeable, Lake Biwa. I can’t say the soundtrack is a powerhouse because most of the time, it just seems to be there. However, two noticeable traits for the soundtrack are the character voice expressions to convey their feelings. This is expressively shown later on when the brothers goes through hard times in their lives. The other trait is the OP and ED song with great details and decorative coordination. OST is on par for most parts but artwork outshines this department. I do give praise to some of the soundtrack for the action though as it almost gives some episodes a cinematic feeling especially for pivotal scenes. To put it simply, this show is a resonant saga with events from the past infused with storytelling of the present. And with a colorful cast of characters, it’s a presence to be remembered for their roles. All sort of feelings are bought out throughout the story that are not just told but shown to make the audience feel as if they are there themselves. Despite some predictable outcomes, the story remains honest with its premise with engaging dialogues and balanced comedy. This show is an underdog that registers every worth of time that should be invested into. I came across this anime by pure coincidence. 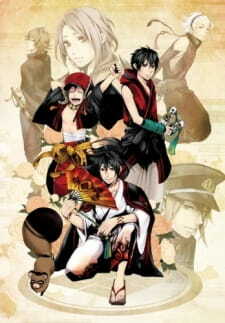 Out of the very few fall anime in my “to watch” list, Donten ni Warau was not in consideration. But out of boredom, I decided to watch the then released 3 episodes of this anime and I was undoubtedly hooked. Personally, I thought that this anime was just to my tastes. An anime that focuses on brothers’ relation with a cool (yet doting) big brother, a haughty middle brother (with a complex) and a cute little brother with an interesting speech pattern. This anime was perfect. It made me laugh, cry and a feel a fluster of various other emotions. But then came episode 7 and that’s where things go wrong. Awfully wrong. After an extremely emotional episode the last thing you would expect from the next episode would be a back story of a random character. I’ll be honest, this pissed me off greatly. I don’t care whether the back story was necessary or not (seemed like unnecessary romance sub-plot to me but I might just be bias) but it was almost inappropriate to deviate (in fact neglect) the death of the main character and the aftermath of such tragedy on the brothers in such a way. In the following episode, I was more than ready to forget the previous episode’s pacing until Soramaru got over the death of his brother in an extremely baffling way in a single episode. Perhaps “getting over” isn’t the right phrase here but nevertheless, his optimistic attitude was sudden and seemed almost out of character for a person who was so obsessed with surpassing his brother. This wasn’t enough to make me dislike the show though. After all, I had already gotten attached to the characters of the anime more than I was expecting. And perhaps because I liked the characters so much, I was appalled at “unexpected plot twist” of this anime. It wouldn’t exactly be wrong to say the twist was kind of cliché; but more than that, to me, it was low. The kindest character turns out to be the villain, has a twin partner-in-crime, and his background was a farce. Oh shocker! As far as the sound and art is concerned, DnW has pretty standard art with smooth action scenes with no major flaws. The opening and ending songs are suitable for the mood of the anime. The ending song especially was one of my favorite of the season. The background music is very fitting for a historical anime and overall had a very pleasing feeling. I enjoyed the first half of this anime more than anything. In fact, I’m extremely dejected at how I gradually lost interest in an anime that I considered was bound to be one of my top favorites this season. But despite all my nitpicking and complains, I was satisfied that the anime at least had a happy ending. It’s a shame that Donten ni Warau couldn’t be a “masterpiece” for me, but it was a compelling anime nevertheless.